The old school eugenics of the previous century was aimed to eradicate all sorts of unfit and anti-social behavior, from theft to laziness to wandering to sexual deviance. The source of these problems was thought to be a biological defect in the defective genes, or germ plasm, as it was known a hundred years ago. While some silly people in Chicago are decrying the use of certain words in classrooms, an entire piece of Midwest history is being suppressed about the previous, 20th Century, version of "Race to The Top." 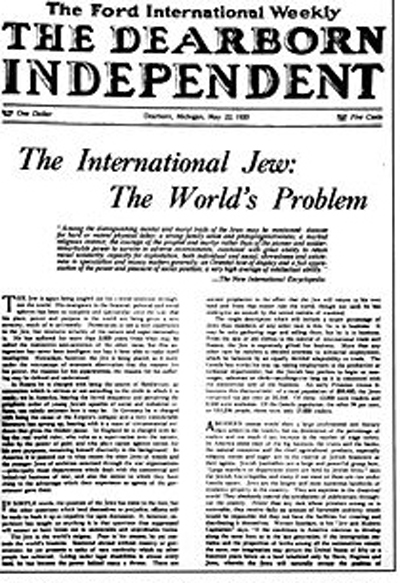 Above, a copy of Henry Ford's magazine "The Dearborn Independent," which, along with other American Eugenics fans, provided much "scientific" material for Adolph Hitler's "Mein Kampf." Eugenics and its most ruthless practitioners had to be defeated by force of arms during the previous century, despite the huge resources (including the support of the Robber Barons of the time) that went in to providing it with professorial and other backing. With the rise of behaviorism and the eventual scientific acceptance of what common sense has always told us about the importance of environment in shaping organisms, genetic determinism finally gave way, even if biology textbook writers continued to imprint the eugenics dogma in school books well into the 1950s. And even as the publication of The Bell Curve in 1994 signaled a final assault by the last eugenicist hold-outs defending the position of genetic or biological inferiority of poor and non-white populations, that last hurrah was not enough to win the day, even though it did provide a reenergizing text for another generation of die-hard racists. It seems fitting, then, that the author of that odious tome, Charles Murray, would be on the leading edge of the new eugenics, which picks up where the other one died, i.e., with the continuing assumption that the defectives in our society who are represented by the poor, the disabled, the immigrant, whether white or minority, must be altered in order for white middle class civilization to continue. This is the subject of Murray’s admitted swan song on the topic of human defectives, Coming Apart: The State of White America, 1960-2010. In 1912 at the beginning of the 20th Century eugenics adventures in advancing the strong and eliminating the weak, social efficiency educator and influential curriculum reformer, John Franklin Bobbitt, argued that progressive urges among some reformers of that time to educate the poor and to offer assistance to them were simply inefficient and wasteful efforts that perpetuated the survival and continued breeding of the weak. As founder of the new “science” of education curriculum, Bobbitt proposed the “abolition of public charities, public school systems and all other public agencies which go out of their way to preserve the weak and incapable” (Bobbitt quoted by Selden in Inheriting Shame . . ., 1999, p. 42). Bobbitt preferred, instead, to let “nature” run its course for the weak and the unfit, and in the congested and disease-ridden urban centers of his day, nature would not take much time to get the desired results. So who is responsible now, a hundred years later, for the viral spread of bad values, morals, and culture? Not defective genes this time or bad germ plasm, as it was believed 100 years ago but, rather, weak and defective cultural values that have been seeded and spread by progressive policies ostensibly aimed to help the poor, efforts that can be traced back to the beginning of the Civil Rights Movement just preceding the War on Poverty. These working class defectives of today that Murray uses to make his argument are not to blame for what got them here to their depraved state, just as the defectives of 1912 could not be blamed for taking a hand when drowning. For Murray and rest of the conservative and neoliberal elites the blame, rather, goes to the liberal social policies that offered help without yelp, that provided encouragement and assistance that did not at the same time eradicate the laziness, wandering, crime, drug use, and sexual deviance but, rather, accepted and promoted the survival and spread of those cultural memes that now infect a whole generation of increasingly poor blacks, brown, and even whites. And thus, the beginning a new eugenics era is upon us if the Murrays of the world have their way, and they will not deny this time, but put to good use, the sharpened behaviorist techniques, cognitive corporate training, anti-cultural “scientific” curriculum and assessment, and “positive” psychology methods to save the world from defective memes that perpetuate poverty and dysfunction, and, thus, American ascendancy in the global economy. The new containment centers and segregated institutions where this work will be centered is the school, or a corporate version of it, where the KIPP charter schools provide the model for others to follow. In the name of choice, equality, and differentiation, this kind of segregated re-education of the poor can proceed without public scrutiny of what goes inside these corporate reform schools that preach “no excuses” and practice zero tolerance and focus on a distant and unlikely future for children whose minds and behaviors are being altered to assure the continuation of a corrupt socioeconomic caste system and a narrow and anemic cultural catechism. There is one other significant difference between the biological determinists of a hundred years ago and the cultural determinists of today. Just over a hundred years ago the devout social Darwinist, Andrew Carnegie, exercised his philanthropic muscle to fund the creation of the eugenics research hothouse known as the Station for the Experimental Study of Evolution, in Cold Springs Harbor, New York. He got nothing for it except the satisfaction that his Spencerian values had been expressed in a way that would have lasting effect. In 2012, economic enablers like Bill Gates and Eli Broad can stand on a similar belief that cultural defectives can be eliminated without the costly acknowledgment of poverty, but this time around these modern day Carnegies can make sure that they are repaid in tax breaks for their classist and racist largesse.